The Women's British Open is a major championship in women's professional golf. It is recognized by both the LPGA Tour and the Ladies European Tour as a major. The reigning champion is Georgia Hall, who won by two shots at Royal Lytham & St Annes in 2018 to earn her first major title. Since it became an LPGA major in 2001 it has generally been played in late July or early August. The 2012 edition was scheduled for mid-September, due to the 2012 Summer Olympics in London, while the 2014 event was played in mid-July, the week prior to the Open Championship. In 2019 it will be known as the AIG Women's British Open. From 2007 to 2018, it was called the Ricoh Women's British Open while the previous twenty editions (1987–2006) were sponsored by Weetabix, a breakfast cereal. 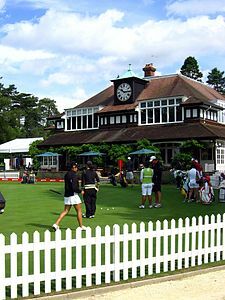 The practice green at Sunningdale Golf Club in 2008. The Women's British Open was established by the Ladies' Golf Union in 1976 and was intended to serve as the women's equivalent of The Open Championship. At first, it was difficult for the organisers to get the most prestigious courses to agree to host the event, with the exception of Royal Birkdale, which hosted it twice during its early days — in 1982 and 1986. After nearly folding in 1983, the tournament was held at the best of the "second-tier" courses, including Woburn Golf and Country Club for seven straight years, 1990 through 1996, as well as in 1984 and 1999. As its prestige continued to increase, more of the links courses that are in the rotation for The Open Championship, such as Turnberry (2002) and Royal Lytham & St Annes (1998, 2003, 2006) hosted the tournament, in addition to Royal Birkdale (2000, 2005, 2010). In 2007, the tournament took place at the Old Course at St Andrews for the first time. In the 2010s, two additional Open Championship venues became first-time hosts for the women's event: Carnoustie (2011) and Royal Liverpool (2012). The tournament has yet to be played at four Open Championship courses: Muirfield and Royal Troon in Scotland, Royal St. George's in southeastern England, and Royal Portrush in Northern Ireland. Unlike its male counterpart, the Women's British Open has not adopted a links-only policy. This greatly increases the number of potential venues, especially the number close to the major population centres of England. Through 1993, the tournament was an official stop only on the Ladies European Tour, with the exception of the 1984 edition, which was co-sanctioned by the LPGA Tour. Starting in 1994, it became a permanent LPGA Tour event, which increased both the quality of the field and the event's prestige. It has been an official LPGA major since 2001, when it replaced the du Maurier Classic in Canada. In 2005, the starting field size was increased to 150, but only the low 65 (plus ties) survive the cut after the second round. In both 2007 and 2008 the prize fund was £1.05 million. Starting in 2009, the prize fund changed from being fixed in pounds to U.S. dollars, and is now $3.25 million. Tied for most victories in the Women's British Open with three each are Karrie Webb of Australia and Sherri Steinhauer of the United States. Both won the tournament twice before it became an LPGA major and once after. Yani Tseng of Taiwan and Jiyai Shin of South Korea are the multiple winners as a major championship. The other multiple winner is Debbie Massey of the U.S., with consecutive wins (1980 & 1981) well before it was an LPGA co-sanctioned event. In 1992 the second day was washed-out and the event reduced to 54 holes. In 1990 Alfredsson won with a par at the fourth extra hole. In 1988 Dibnah won with a birdie at the second extra hole. The 1984 tournament was co-sanctioned by the LET and LPGA Tour. Prize money for this event was in US dollars; £ values here are based on an exchange rate of $1.25=£1. The 1977 event was decided on "countback". Saunders won the title because she had a better last round; 76 to Everard's 79. This table lists the total number of titles won by golfers of each nationality as an LPGA major (2001–present). The Smyth Salver is awarded to the leading amateur, provided that the player completes all 72 holes, for one year. The winner also receives a silver medal. The salver was donated by Moira Smyth, a past president of the Ladies' Golf Union. ^ "Championship History". Archived from the original on 19 August 2013. Retrieved 31 July 2013. ^ a b "Ricoh Women's British Open Past Winners". LPGA. Retrieved 31 July 2013. ^ "Descampe charges but Geddes is champion". The Glasgow Herald. 7 August 1989. p. 18. ^ "Nicholas breaks through at last". The Glasgow Herald. 3 August 1987. p. 10. ^ "Laura outscores foreign invaders". The Glasgow Herald. 13 October 1986. p. 10. ^ "Miss King begins a new reign". The Glasgow Herald. 7 October 1985. p. 8. ^ "Dale deserves prize for her lone battle". The Glasgow Herald. 8 October 1984. p. 17. ^ "Professional win for a new Spanish graduate". The Glasgow Herald. 2 August 1982. p. 15. ^ "Debbie pulls away from the field". The Glasgow Herald. 3 August 1981. p. 15. ^ "Belle second with a 69". The Glasgow Herald. 28 July 1980. p. 13. ^ "Birdie finish gives Alison British title". The Glasgow Herald. 30 July 1979. p. 15. ^ "Janet in youngest British champion". The Glasgow Herald. 29 July 1978. p. 15. ^ "Vivien's title on last 18". The Glasgow Herald. 3 September 1977. p. 16. ^ "Sandra's hopes dashed". The Glasgow Herald. 4 September 1976. p. 14. ^ "Royal Troon to host Women's British Open in 2020". ESPN. Associated Press. 3 August 2018.